How can I add my company logo to the reports? What iPad device should I buy? Is het mogelijk om per rapport te betalen? When you log in on the website www.smartcheckups.com, you click on "account", and on the bottom of the settings page you can add your logo, which will be automatically added to the reports on the iPad. How to get the signatures on your inspection report. Obviously, you can always print the report and then gather the signatures from all the parties involved. However, you can also get the signature without the need to print the report. For this you need an application for signatures like DocuSign. This application is free and you can download it from the App Store. When you have installed DocuSign on your iPad you can export the reports from Smart Checkups to DocuSign to get the signature. To do so, simply go to the report in the Smart Checkups application. When you view the report, you will also see a button with 'options' in the upper right corner. From 'options' select the export feature. Among all the export possibilities, you will now also see the option to export the report to the DocuSign app that you have installed on your iPad. When the report is opened in Docusign, you can collect the signatures. How do you save time by creating templates in advance? Get started quickly with a previously created template. Suppose you need to do regularly an inspection of a certain type of property. How to create a template containing the most typical elements you expect in such kind of property? Switch to the tab "Templates"instead of "Properties" on the iPad. From here, you'll find a standard template already pre-installed on the iPad. If you wish to edit the existing template, you could duplicate it by clicking "+", open it, and next, click "edit" to change it. In case you wish to create a new template from scratch, you basically enter the name of the new template, and next create the rooms and the elements. Once you switched back to the Properties overview and you create new checkup, the last option in the menu is to "select a template". In this way you are able to start immediately with a checkup with all the different elements ready. Only comments and photos need to be added. I only see the name of the parties, and not their full address? Eventually, in the final report the address of the parties will fully appear. What if you can not find the photos made during inspection back on the camera roll? When the photos are not shown in the camera roll, you can easily adjust this in the settings. On the top left on the home screen of the app you notice the 'settings' button. In settings you can choose the option 'save photos in camera roll ' and activate this option. We suggest to use the "Skitch" app. You can very easily switch from SmartCheckups to Skitch, make annotations, save and switch back to SmartCheckups where you can attach that image to the element of your choice. When you finalize the report, there is a comment’s section at the beginning of the report, at what stage of the report can you add any comments so they show In the final report? On https://www.smartcheckups.com/account/placeholders, you can add placeholders. If you want to show an introductory text or other recurring texts such as your general ‘standards and conditions’ in your reports, you can copy paste that content there, and after a reboot of your ipad, import it in your reports under "configure report" - comments or introduction/termsofservice. When you turn on "Include notes", it will also create some white space where you could add handwritten notes after you printed the report. How to save your high-resolution pictures and share them with a client. After you finished your inspection, you can upload all the data to the Smartcloud by clicking on the "cloud" icon on the iPad or by swiping from left to right on the inspection. This requires a good WIFI connection. Once the upload is finished, all the data, including the pictures are available on the website of www.smartcheckups.com. From there, you can quickly search for, download and share property pictures from archived reports with your clients. Is it possible to update/edit the finalized report afterwards? Yes you can change and edit a finalized report. However note that there are difference for finalized reports that include signatures. If the report was signed digitally: The signatures are no longer included in the revised document. This means that you have to ask for signatures again for the newly revised and updated report. In this case, we recommend you to add an addendum to the report. If the report was not signed digitally: You can edit the finalized report. Open it by clicking on the blue (i) icon next to the report. After editing you can recreate the report again ( via 'configure' > 'regenerate report). In this way the old report is overwritten. Another option is to copy the entire template with content ( via 'create new report' > copy last report + photos and data). Is it possible that you have added a party/contact to a report, but that you forgot to associate a role to that party, like tenant, property owner. Can you please check that. So make sure that you have associated a role to the contacts that you have included in your report. This might have caused the problem. Can I generate a short link in the email when sending the report ? Only valid for Belgian rental contracts - if it might be the case in another country as well, thanks for letting us know. How can I add a disclaimer, introduction or general notes to the report? Via the web application www.smartcheckups.com you can add several text blocks (e.g. disclaimers, introduction notes e.a.). Simply login to www.smartcheckups.com and go to the section 'placeholders' in the header menu. Here you can add the text blocks that you wish to integrate as a text block in your inspection reports. Copy a text block that you use at the moment for your inspection reports (e.g. use an existing disclaimer text, introduction, general notes) and paste that text as a new textblock. When you have create the text block on the web application, you can import and use these in the reports that you create on the iPad. Via the 'configure' menu in your inspection, you can now import a textblock. The device does not need 3G connection. The app works off-line during the property inspection. The synching of the reports and photo's is automatically processed when the iPad is connected to the Wifi afterwards. 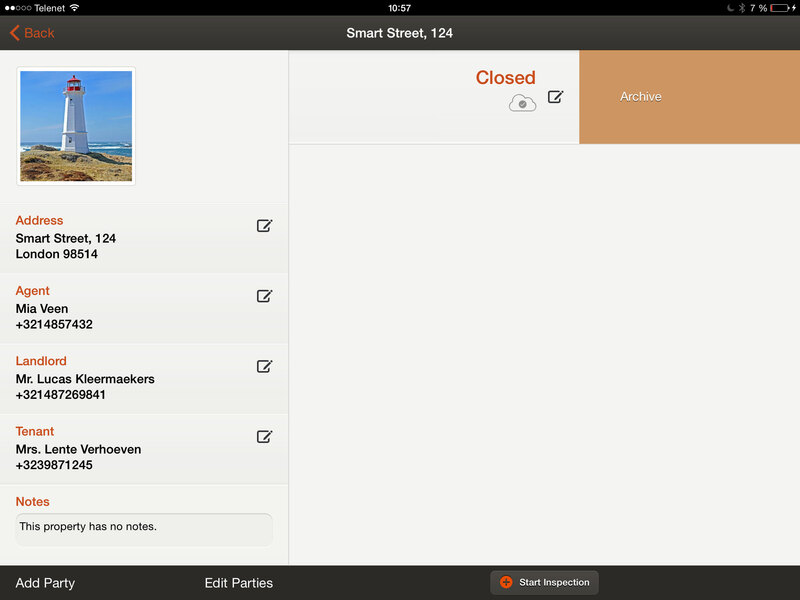 We've specifically developed a performant iPad app for property inspections and are not available on other platforms. Yes, you have the choice between the pay per use pricing or a subscription fee allowing for unlimited reports. Have a look at the pricing at the website or contact us. If I delete the app, and reinstall it, will I have lost all open (not finalized) reports? Be aware when you delete the app. You will lose all reports which are not uploaded to the cloud yet. Get in touch if you plan to do so. The inspection reports can take quite some storage capacity on your iPad. Please know that finalized reports can always be deleted from the iPad by archiving them to SmartCloud. Swipe on the report from right to left to archive the inspection. The report itself, all photos and notes will be synched to the cloud and deleted from the iPad. You'll need a WIFI-connection in order to do so. Once archived, all your data remains accessible after secure login on www.smartcheckups.com. The report and all photos can be downloaded from the SmartCloud. Would you want to download the report back on your iPad, for editing or duplication, swipe from left to right on the item on your ipad to download it. Again a WIFI-connection is required.